This new 45 pages per minute model is an outstanding product and sets the benchmark for mid range fast colour products. 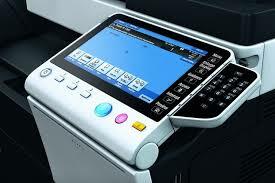 You will find machines now in the market making a very poor imitation of this product such as the Ricoh MPC4503. Be advised that none come close in terms of reliability and performance. The Ineo +454e continues to offer a quality 45 page per minute colour output and comes as a basic 2 paper tray model. A wide range of options can be added to create the most suitable configuration for your business.